If polls are correct, he will be elected for a five-year term. Ukraine’s president holds significant powers over the security, defence and foreign policy of the country. Thirty-seven candidates were removed from the ballot paper from the first round and yet the president only picked up about 9% more votes this time. Mr Zelensky gained almost 45 percent. Meanwhile, Mr Zelensky told a news conference on Sunday that he would “reboot” peace talks with the Russian separatists. Mr Zelensky is best known for starring in a political satirical drama called Servant of the People in which his character accidentally becomes Ukrainian president. With no previous political experience, his campaign focused on his difference to the other candidates rather than on any concrete policy ideas. 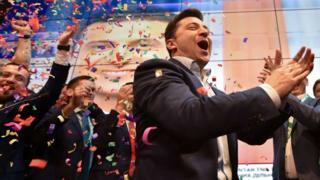 Analysts believe Mr Zelensky’s informal style and vow to clean-up Ukrainian politics resonated with voters who are disillusioned with the country’s path under Mr Poroshenko. Ms McKee, 29, died after she was struck by a bullet as she observed rioting in Londonderry’s Creggan estate on Thursday night. The pair, aged 18 and 19, had been held under the Terrorism Act. It was also confirmed on Sunday that Ms McKee’s funeral will held at St Anne’s Cathedral in Belfast on Wednesday. Her partner Sara Canning said the service would be a “celebration of her life”. It is understood the funeral service will be attended by political and faith leaders from across Northern Ireland. Writing on Facebook, Ms Canning called on attendees to wear Harry Potter and Marvel related items. Speaking on Saturday, PSNI Det Supt Jason Murphy said police had received “positive support from the community” but needed to “convert this support into tangible evidence”. “We will continue to work positively and sensitively with the local community to achieve this,” he said. 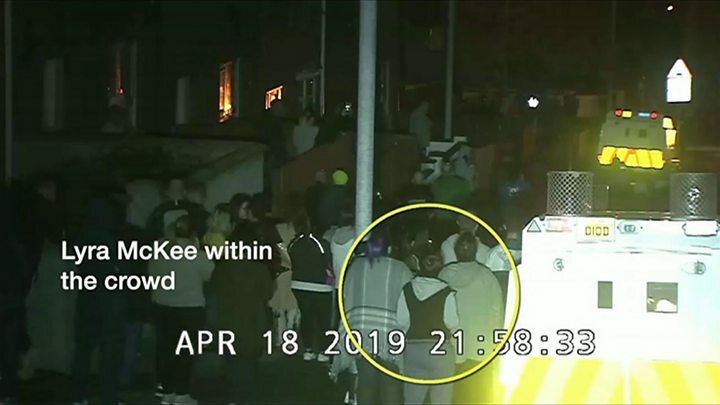 Det Supt Murphy appealed specifically to people who were in Fanad Drive and Central Drive on Thursday night, the area where Ms McKee was fatally wounded, to come forward with footage of the incident. “Please come and speak with my detectives and provide us with your mobile phone footage,” he said. 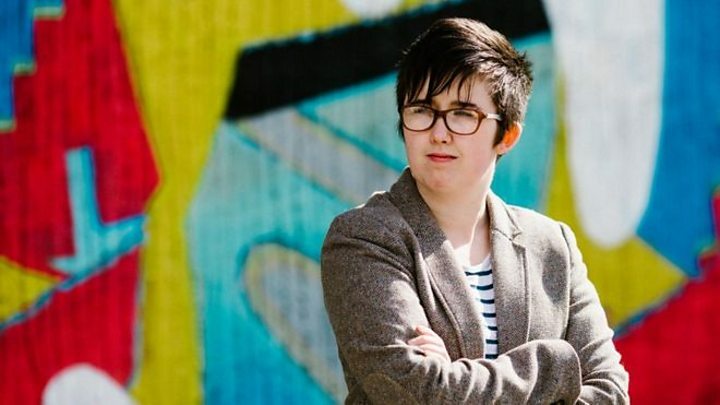 Meanwhile, the Catholic bishop of Derry said the community in the nationalist area where Lyra McKee was shot dead needs to be “liberated” from dissident republicans. 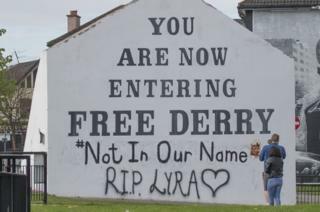 The words “not in our name – RIP Lyra” have been added to the famous Free Derry mural in the city’s Bogside area. Police have blamed dissident republicans for the murder, which happened after violence broke out as officers were carrying out searches for weapons and ammunition. Intelligence had led them to suspect that there could be attacks on police over the Easter period. Ms McKee was standing near a police 4×4 vehicle when she was shot after a masked gunman fired towards police and onlookers. A statement issued by the hard-left republican political party Saoradh on Friday sought to justify the use of violence on Thursday night. Saoradh, which translates as liberation in Irish, has the support of the dissident republican group the New IRA. Bishop Donal McKeown said the “small” group of dissident republicans in Derry is a “danger to all of us”. He told the BBC’s Sunday Sequence that people in the Creggan estate were “disgusted at what happened”. “The one liberation they require in that community is liberation from Saoradh,” he said. Ms McKee’s killing came 21 years after the Good Friday peace agreement was signed in Northern Ireland. The 1998 peace deal marked the end in the region of decades of violent conflict – known as the Troubles – involving republicans and loyalists during which about 3,600 people are estimated to have died. The Good Friday Agreement was the result of intense negotiations involving the UK and Irish governments and Northern Ireland’s political parties. Tributes have been paid to Ms McKee from leading figures in the worlds of journalism, politics and beyond. Vigils have been held across Northern Ireland and people have paid tributes to her by signing books of condolence. There’s a growing trend of primary schools running Easter holiday revision classes for formal tests, known as Sats, a teachers’ union says. The NASUWT union says “cramming sessions” are becoming more common in schools ahead of the tests sat in May. It says children should not be in school over the holidays, but should be spending time with their families. Education Secretary Damian Hinds said Sats were tests of the education system in England, “not our children”. The results of Sats tests taken by 11-year-olds are published each year in primary school league tables, published by the Department for Education. Darren Northolt, the NASUWT’s national official for education, said it was the pressure of accountability that was leading schools to open up for Year 6 pupils over the holidays. “Schools think that this is going to give them an edge in getting the results they need – so that’s the driver,” Mr Northolt said at the union’s annual conference in Belfast. He said that while attendance at the Easter booster sessions he was aware of was voluntary, it was not clear what sort of message parents were being sent. “I think children would be better off in the Easter holidays, absolutely, if they have been set some homework and if that homework is useful and productive, they should be doing that. General secretary Chris Keates said: “The growing trend of Easter Sats classes in primary schools is a worrying reflection of the high-stakes accountability regime they operate in. But Mr Hinds said exam stress at primary school level was not inevitable. “All over the world, schools guide children through tests without them feeling pressurised. “These are tests of our education system, not our children. Last week, Labour leader Jeremy Corbyn announced he would scrap Sats if his party came to power, saying the move would help improve teacher recruitment and retention. Instead, Labour would introduce alternative assessments which would be based on “the clear principle of understanding the learning needs of every child,” he said. But Schools Minister Nick Gibb said abolishing Sats would be “a retrograde step”. He said the move would “keep parents in the dark” by preventing from knowing how good their child’s school is at teaching maths, reading and writing. Amir Khan “should retire now” after being pulled out of his fight with Terence Crawford, says Steve Bunce. Briton Khan, 32, took a low blow from American WBO world welterweight champion Crawford in the sixth round at Madison Square Garden in New York. Unbeaten Crawford, 31, later accused Khan of quitting which the former two-weight world champion denied. “We can’t keep applauding him for his heart and guts and bravery,” Bunce told the 5 Live Boxing podcast. Khan was knocked down in the first round by Crawford and was behind on all three judges’ scorecards when the fight ended. Crawford – who has held world titles in three weight divisions – drove a left hook into Khan’s groin 47 seconds into the sixth, leaving him in “too much” pain to continue. “I thought Amir Khan looked awkward, his balance looked poor, his shot selection wasn’t great,” Bunce added. “Sometimes his feet can be bad when he’s lazy. That’s not a criticism, that’s a fact. ‘He wasn’t looking for a way out’ – did Khan quit? Khan’s trainer Virgil Hunter said the boxer was “incapacitated” by Crawford’s low punch, with Khan adding he “couldn’t think straight” after the blow. On Sunday, Khan once again rejected Crawford’s claims that he had quit, saying on Twitter “I’d rather get knocked out cold” – before revealing he was “peeing blood”. “I don’t think there is any suggestion he got hit with a half shot and decided to quit,” said Bunce. “Crawford doesn’t think he hit him low, so of course Crawford thinks he quit because he thinks he hit him with a legitimate shot. Khan has faced criticism throughout his career, both in and out of the ring, and Bunce believes Saturday’s finish could add fuel to the fire. “It’s going to run and run, because it will suit some people’s agenda to add ‘quitter’ to ‘glass chin’, to add ‘quitter’ to ‘flash so-and-so’,” Bunce added. “I can’t say with certainty that he quit. I can’t say with certainty that at that point he was hurt enough. Former world champion Barry McGuigan said it was “very dangerous” to call Khan a quitter. Speaking on BBC Radio 5 Live’s Sportsweek programme, McGuigan said: “You look at Khan’s career and the fights he’s been in and the one thing he always had was immense courage, determination and getting up off the floor. “You think of the Breidis Prescott fight, the Canelo (Alvarez) fight, the Danny Garcia fight – there’s no quit in him. “I just think he took the intelligent option and got out because he was down. “If he’d gone on and been humiliatingly knocked out and dropped several times and then flattened, then people would have been calling for him to stop. 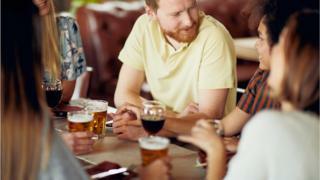 About 76 pubs a month “vanished” from the communities they served in 2018, as people spent less on going out and pubs faced cost pressures, said property firm Altus Group. But this was down from 138 a month during the previous seven years. Alex Probyn, of Altus Group, said recent cuts to business rates had helped. According to the firm’s research, the number of pubs slumped from more than 54,000 to 43,000 between 2010 and 2017. Industry group the Campaign for Real Ale (Camra) says more people are drinking at home to save money, while younger people are consuming less alcohol in general. And pubs have faced a “triple whammy” of taxes in the form of high Beer Duty, VAT and business rates. “Pubs currently pay 2.8% of the business rates bill but only account for 0.5% of total business turnover, which is an overpayment of around £500m by the sector each year,” it says on its website. High business rates are also viewed as contributing to the rising number of retail closures on Britain’s high streets. But Altus said government changes to rates were starting to benefit the pubs industry, with the number liable to pay rates at all down by more than 1,500. It added that new rates relief, brought in on 1 April by the Chancellor, would help further. “The new retail discount, which slashed rates bills by a third for high street firms with a rateable value less than £51,000, will help independent licensees in small premises,” said Mr Probyn. Arsenal’s hopes of a top-four finish were dented after Christian Benteke’s first goal in a year helped Crystal Palace to an excellent win which confirmed their Premier League place. Benteke was left unmarked to head Luka Milivojevic’s delivery past Bernd Leno, only for Mesut Ozil to equalise with a clever finish shortly after half-time. However, two goals in eight minutes ended Arsenal’s 10-match winning league run at Emirates Stadium. Wilfried Zaha capitalised on a mistake by Shkodran Mustafi to restore Palace’s lead and James McArthur’s header made it 3-1 before Pierre-Emerick Aubameyang reduced the deficit with his 19th league goal of the season. With Manchester United on the receiving end of a hammering at Everton earlier in the day, and Tottenham losing at Manchester City the previous day, this was an ideal opportunity for the Gunners to take a big step towards securing a Champions League place. Yet Unai Emery’s side were punished for an awful defensive performance as they fell to only a second home league defeat under the Spaniard. The marking for Benteke’s goal was non-existent, Mustafi’s failed attempt to block Zaha ended in embarrassment and a second Palace goal, while McArthur was also left unmarked to head home the third. Captain Laurent Koscielny and leading scorer Aubameyang were starting their third game in eight days but this was an under-par performance by a team looking to finish in the top four for the first time in three seasons. The Gunners monopolised possession but it required a double change at half-time to help them get back on level terms after Benteke’s header separated the teams at the interval. Alex Iwobi, one of the substitutes, was involved in Ozil’s lovely equaliser, his pass finding Alexandre Lacazette to set up the German. That should have been the signal to push on, yet Arsenal fell away and, despite a late rally which saw Aubameyang score, will fall out of the top four if Chelsea beat Burnley at Stamford Bridge on Monday (20:00 BST). Despite gathering only eight points from their first 12 games, Palace will spend a seventh successive season in the top flight after securing safety with three matches to spare. While their home form has been disappointing, Palace have played with freedom and confidence on the road. Having won at title-chasing Manchester City, they can now add a first win at Arsenal for 25 years to their impressive collection of away achievements. Manager Roy Hodgson will hope Benteke can kick-on after ending a a run of 19 appearances, 25 shots and 358 days without scoring. The Belgian, who once scored 19 goals in a Premier League season for Aston Villa, missed a glorious chance to double Palace’s lead on the stroke of half-time. It did not prove costly, Palace showing character to respond with two quick goals after Ozil’s equaliser. Scott Dann and Martin Kelly were strong at the heart of the defence, while skipper Milivojevic was involved in two of his side’s three goals. In addition, Vicente Guaita clawed away a dangerous Ozil cross and Iwobi shot straight at the Palace keeper. Wilfried Zaha has scored eight away goals for Crystal Palace in the Premier League this season – only Tottenham’s Harry Kane (11) and Leicester’s Jamie Vardy (10) have netted more. Arsenal suffered their first home league defeat in a London derby since January 2016 when they lost 1-0 to Chelsea. Palace avoided defeat in both league meetings with Arsenal in a campaign for the first time since 1979-80. Arsenal’s Mesut Ozil has been directly involved in 52 goals in the Premier League at the Emirates Stadium (20 goals, 32 assists). Palace have scored 29 goals away from home in the Premier League this season – their most in a single campaign in the competition and joint-most overall in a top-flight season. Arsenal play their fourth game in 10 days on Wednesday when they travel to face Wolves (19:45 BST), while Crystal Palace host Everton next Saturday (15:00). Jurgen Klopp’s side had to be patient as they dominated a dogged Cardiff side, who had chances of their own to cause an upset. Liverpool made the breakthrough in spectacular fashion, as Georginio Wijnaldum met Trent Alexander-Arnold’s low corner with a thunderous first-time effort which threatened to break the net. The wild celebrations spoke of the visitors’ relief, and they had to negotiate some nervy moments, most notably a staggering miss by Cardiff captain Sean Morrison, who miscued a header with the goal at his mercy. Things then got worse for Morrison, who conceded a penalty after grappling with Mohamed Salah, and substitute James Milner confidently converted the spot-kick to seal victory for the visitors. Cardiff remain in the relegation zone, three points adrift of safety. Liverpool, meanwhile, restore their two-point lead at the top of the table over Manchester City, who play their game in hand away at Manchester United on Wednesday. The last time Liverpool were in Wales’ capital city in 2014, Luis Suarez scored a hat-trick in a 6-3 thrashing of a Cardiff side managed by Ole Gunnar Solskjaer and destined for relegation. That chaotic encounter was symptomatic of Liverpool’s title challenge that season: thrilling and brimming with goals but also lacking the defensive fortitude of champions. The Reds ultimately fell short – but this time it has been a different story. There are still twists and turns to come in this absorbing title race but Liverpool now have the tightest defence in the Premier League. A record of conceding only 20 goals in 35 games has allowed them to go toe-to-toe with a Manchester City side widely regarded as one of the greatest to have graced this competition. Liverpool are a solid, patient, winning machine these days – their past five league victories had come thanks to second-half goals, and they had to bide their time here as well. Klopp’s side imposed themselves immediately, monopolising possession and pinning their opponents back in their own half. Their fabled front three all had chances to score in the first half: Roberto Firmino firing over when clean through on goal, Sadio Mane flicking a first-time effort over and Salah seeing a low shot smothered by Neil Etheridge. Cardiff, however, were standing firm, with centre-backs Morrison and Bruno Ecuele Manga marshalling a robust defensive display from the hosts. Liverpool did not panic and eventually engineered a way through their opponents with what seemed to be a pre-planned move, with Alexander-Arnold’s low corner steered towards the onrushing Wijnaldum, who swept in an emphatic finish. Klopp’s side had chances to extend their lead – with Jordan Henderson spooning one particularly good one over – but this was another clinical display, Milner’s penalty making it nine successive wins in all competitions for the Reds. James Lowe’s smart finish and Luke McGrath’s drive over gave Leinster a deserved 11-point lead at the break. Thomas Ramos’ boot briefly brought Toulouse back within range, but Scott Fardy burrowed over to convert a spell of second-half pressure. An increasingly desperate Toulouse rarely threatened a comeback. Leinster will be aiming to become the first team in the competition to lift the trophy for a fifth time in the 11 May showpiece. Their trademark efficiency and accuracy was on full display as their well-oiled gameplan nullified Toulouse’s power and creativity. But it would be wrong to credit only the collective strength of Leo Cullen’s side. Prop Cian Healy and London Irish-bound flanker Sean O’Brien showed fine individual skill as their crisp hands helped spring Lowe for the first try on 14 minutes. With Toulouse second row Richie Gray sin-binned for a cynical knock-on at the base of a ruck, Leinster exploited their man advantage with a mammoth driven maul from which McGrath emerged with the ball and score. The home side’s defence was equally well-judged. Robbie Henshaw’s knock-on under his own post earned him a yellow card of his own, but averted a likely try with Charlie Faumuina poised to thunder into contact. When Fardy, a late replacement in the starting line-up for Rhys Ruddock, barged over Toulouse’s realistic hopes were snuffed out. The showdown against Saracens, who have made serene progress to the final after a quarter-final defeat by Leinster last year, promises to be a intriguing clash. Toulouse’s recent free-running try-scoring had ignited hopes that their young side could once again capture a title they last lifted in 2010. However, with Antoine Dupont, a specialist scrum-half, deployed at 10, they struggled to reproduce the pyrotechnics that saw them beat Racing 92 in the previous round. Springbok wing Cheslin Kolbe’s occasional bursts looked their likeliest way back into the game. Toulouse were also undermined by basic errors. Full-back Ramos put his side under needless pressure with one kick charged down by Gary Ringrose and a drop-out flying dead. Gray’s reckless yellow card then left the French league leaders irreversibly undermined a minute later when McGrath was shoved over for Leinster’s second. The decision to withdraw All Black Jerome Kaino and Joe Tekori from their back row in the second half also robbed them of momentum and experience. Leinster coach Leo Cullen: “I think our guys showed a lot of resilience, particularly as they got close to our tryline. They’re good qualities to have in these big games. “There was great fight for each other. You could see the players, how much it means to them. “I thought Sean O’Brien was really exceptional today. It’s not just his performance, it’s how he leads the group. Leinster fly-half Johnny Sexton speaking to Virgin Media: “During the week I felt like I was cramming for a big exam, I haven’t trained in a few weeks so I had to fit in a lot of work during the week. “It’s special, but we don’t play to get to finals, we play to try and win stuff. Toulouse captain Jerome Kaino: “I think our young group can take a lot of experience from that game. Leinster: Kearney; Larmour, Ringrose, Henshaw, Lowe; Sexton, McGrath, Healy, Cronin, Furlong, Toner, Ryan, Fardy, O’Brien Conan. Replacements: Tracy for Cronin (34), Deegan for Fardy (42), Fardy for Deegan (51), E Byrne for Healy (60), R Byrne for Sexton (66), Bent for Furlong (66), Doris for Ryan (78), O’Sullivan for McGrath (78), O’Loughlin for Henshaw (78), Deegan for Conan (78). Replacements: Baille for Castets (51), Van Dyk for Faumuina (51), Tolofua for Tekori (51), Faasalele for Kaino (51), Ntamack for Bezy (55), Medard for Ramos (55), Cros for Arnold (60), Marchand for Mauvaka (62). Great Britain ended a 26-year wait for Fed Cup promotion when Katie Boulter came from behind to beat Zarina Diyas to seal a play-off win over Kazakhstan. British number one Johanna Konta had put GB one win away from World Group II with a stunning comeback in a 4-6 6-2 7-5 win over Yulia Putintseva. Boulter trailed by a set and a break – and was troubled by a back problem – before beating Diyas 6-7 (1-7) 6-4 6-1. The win put GB 3-1 up in the best-of-five tie at London’s Copper Box. Five British citizens have been killed in explosions at hotels and churches in Sri Lanka on Easter Sunday. Police say at least 207 people have been killed and 450 injured in eight blasts, six of which were in Colombo. Three Britons and two others with joint US and UK citizenship among the dead, Sri Lanka’s foreign ministry said. The Foreign Office has not confirmed the figure and said it was working with the Sri Lankan authorities to establish the number of citizens who had died. Officials in Sri Lanka say there have been at least 27 foreign casualties. Danish, Turkish and Dutch citizens are also among those known to have died. The UK’s High Commissioner to Sri Lanka, James Dauris, said he had spoken with Britons in hospital “who have been affected by today’s senseless attacks”. Mr Dauris urged those still in the country to contact relatives and to follow instructions from local authorities. In the capital Colombo, St Anthony’s Shrine and the Cinnamon Grand, Shangri-La and Kingsbury hotels were targeted. There were also explosions at a hotel near Dehiwala zoo and in the residential district of Dematagoda. 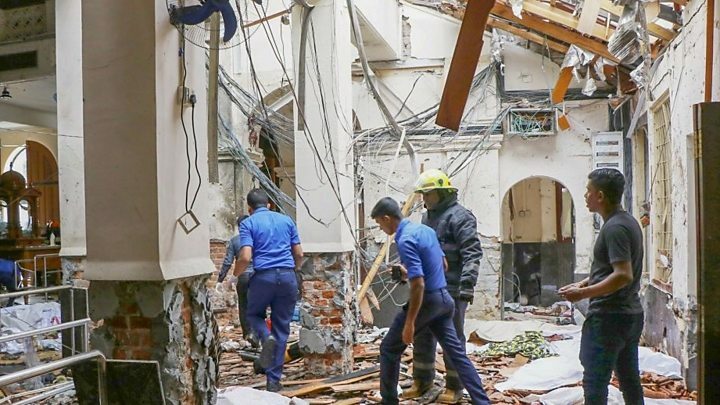 Further blasts took place in St Sebastian’s Church in Negombo, a town approximately 20 miles north of Colombo, and at Zion Church in Batticaloa, on the east coast. Kieran Arasaratnam, a professor at Imperial College London, was on his way to the breakfast room in the Shangri-La hotel when he heard the blast. He told the BBC he saw a young child, aged about eight or nine, being carried to an ambulance, and all around him, “everyone’s just running in panic”. Tourist Marisa Keller, from London, was also staying at the Shangri-La but wasn’t in the hotel when it was attacked. She said she felt “lucky to be alive”. “My cousin called to say a hotel had been bombed,” she said. “We saw the ambulances at the Cinnamon Grand and said ‘you’re right’. “Then we got back to the Shangri-La and saw everybody outside. The staff were trying to make sure who was safe and who was not. “There were lots of bodies, blood, ambulances, police. Swat teams were sent in. Julian Emmanuel and his family, from Surrey, were staying at the Cinnamon Grand when they were woken up by the explosion. “There were ambulances, fire crews, police sirens,” he told the BBC. “I came out of the room to see what’s happening, we were ushered downstairs. Retired doctor Simon Whitmarsh, from Wales, is on holiday in Sri Lanka. The 55-year-old was cycling near the city of Batticaloa when he heard a “big bang”. As a former consultant paediatrician, Mr Whitmarsh volunteered at the local hospital – but was told the situation was in hand. Reports say seven people have been arrested in connection to the attacks, but it not yet clear who is responsible. Sri Lanka’s High Commissioner to the UK, Manisha Gunasekera, said the “magnitude and precision” of the attacks was “unprecedented”. She added that authorities were “doing everything that they can to bring the perpetrators to justice”. The Sri Lankan government said there would be a temporary block on the use of major social media networks and a curfew imposed from 18:00 to 06:00 local time (12:30-00:30 GMT). Local media report that security has been stepped up at the country’s main Bandaranaike International Airport. Sri Lankan Airlines says passengers can travel to the airport by showing flight tickets and passports at check points. The Archbishop of Canterbury, Justin Welby, has condemned the attacks as “utterly despicable destruction” during his Easter address at Canterbury Cathedral. Foreign Secretary Jeremy Hunt said he was “deeply shocked and saddened” by the “horrifying attacks”.